These cookies were a complete accident. And when I say accident, I mean embarrassing mix-up in the identification of nuts. Oh yes. Let me explain. Despite having lived in England for three years, it was only at a Christmas market last year that I tried roasted chestnuts for the first time. And they were delicious. And seemingly so easy to make. So when I returned to the Arizona lands, I decided this traditional English Christmas-time treat should be introduced. I mean, I had already brought mulled wine and mince pies to the Arizonan masses (by which I mean 2, maybe 3 people, tops), roasted chestnuts seemed like a snap. Finding chestnuts would be the hardest hurdle. But as Phoenix seems to have birthed about 15 different mega-supermarkets in my absence, offering a range of unexpected delights (deli! jewelry store! Starbucks! valet parking! car wash! All in the same store! 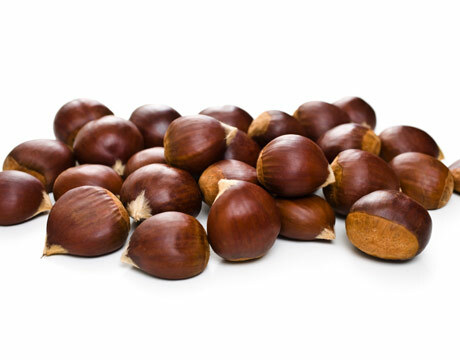 ), finding chestnuts seemingly posed an easy task. Wandering through the "nut boutique" of my local supermarket, I inquired about the location of chestnuts to a friendly employee. I was surprised to learn that the store indeed sold them. I happened over to the bin which was labelled chestnuts and...well...I got confused. Atop a massive bin of nuts was a small bowl of chestnuts. Now the bin resembled the nuts in the picture above (Yes, yes, I'm aware they bear absolutely no resemblance to what chestnuts look like, see picture below). These seemed to have no relation whatsoever to the chestnuts in the bowl that was placed under them. But, in my Starbucks-adled state, I thought, SURELY, these are also chestnuts. So I helped myself to a sackful. Yes. Yes I know. Foolish. But there we have it. And thus I ended up with a pound of brazil nuts and nothing to do with them. I find the best thing to do in these situations is make cookies. And so I set to the task of cracking and shelling a pound of brazil nuts. Which, let me tell you, is harder than it sounds. Fast forward an hour and I was ready to make cookies. After scanning the internet for brazil nut recipes, I happened upon a recipe that called for 2 cups of the things and resembled nothing so much as Mexican wedding cookies- a nice tea cookie dusted in powdered sugar. And thus: brazil nut cookies. I even shaped them into brazil nut shapes, just to emphasize the point. But they were delicious, and fabulous with coffee, so I consider it a mistake well made. Cream shortening with sugar in large mixing bowl. Use the "cream" setting on your mixer (hand or stand). Cut in flour with two knives or a pastry blender. Mix in ground Brazil nuts. Shape dough into one-inch balls, then roll balls between palms or on floured board to form two-inch long sticks. Arrange on ungreased cookie sheet and bake for approximately 20 minutes. Roll in confectioner's sugar when cool.